Piercings There are 18 products. Skull - piercing. Material: medical stainless steel. Please select a color. Skull belly button piercing. Material: 316L medical stainless steel. Pendant size: 18 * 10mm. Bar diameter: 1.5mm. Bar length: 11mm. 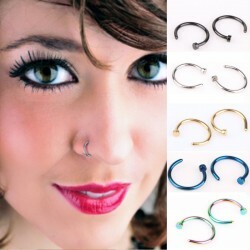 Hoop ring, body piercing. For: ear, eyebrow, lip, nose, universal. Great looks, easy to install. Material: stainless steel. Diameter: 0.8cm. Quantity: 2pcs. Please select a color. Crystal flower, navel piercing. Material: 316L surgical steel. Shape/pattern: plant. Bar length: ~ 10mm. Bar dia. : ~ 1.6mm. Bigg ball dia. : 8mm. Small ball dia. : ~ 5mm. Please select a color. Ball Rhinestone Belly Botton Piercing. Material: 316L medical stainless steel. 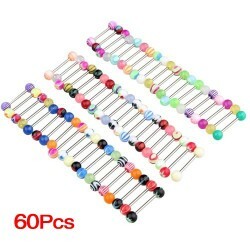 Size: 1.6 * 10 * 5 / 8mm. Amount: 10 pcs. Please select a metal color. Body piercing, green leaf. Material: 316L surgical steel, rhinestone. Bar length: ~ 10mm (0.397inch). Bar diameter: ~ 1.6mm. Please select a type.